Hi gang. Long time no write--I know. But this is important. I have to stay up (wake up?) for this baseball game. As you may or may not know, a MLB "All-Stars" team (heh, it includes Drew Butera) is in Japan playing against a combined NPB All-Star team (Go Carp!). They played an exhibition game and will play a 7-game series... of exhibition games. The problem, however, is that these games are played at 3:00 AM central time, and I am usually "asleep" around then. So far, I have only caught Kenta Maeda's start in the first "real" game of the series, which I guess would be my one pick of things to see (Go Carp! ), but still. 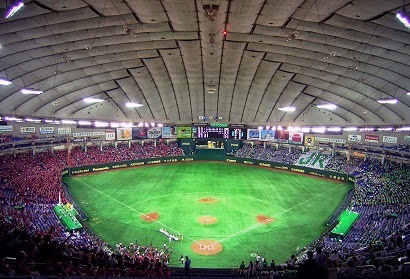 What gets me is that three of the games are being played in the Tokyo Dome, a.k.a. the last (?) surviving replica of my favorite place on earth. And I've already slept through two of the three games. Including one in which JUSTIN MORNEAU HIT A HOME RUN. So, for tonight (tomorrow morning? ), I have an alarm set for 2:45 am. I need to see Justin Morneau in the Tokyo Dome. I cannot let go of the past. I'm not ready. Help. I didn't wake up for the game. Justin Morneau hit a three run home run.